Melt butter in iron skillet. Sprinkle brown sugar over butter. 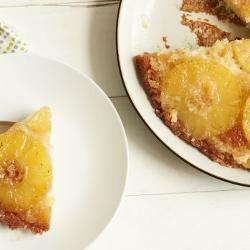 Arrange pineapple slices on top brown sugar/butter. Place cherries in center of slices. Beat remaining ingredients till well blended. Pour over pineapple in skillet and bake for 35 to 45 minutes or until tooth pick inserted comes out clean. Remove from oven and turn onto heat-proof plate.